I have played lacrosse at the competitive level in high school and throughout college. When the days of early morning conditioning practice ended I found myself searching for that same feeling you get after a hard workout. I began coaching lacrosse and field hockey at Regis Jesuit high school, putting the girls through early morning conditioning practices just like I had remembered. It still wasn't the same. I yearned to be lifting and sprinting with them. I then found a groupon for a Crossfit gym in the area. I remember walking in the door and getting a taste of that feeling I had been missing. I fell in love with the community atmosphere and the grueling workouts. I took a liking to Olympic lifting because it was much like the lifting we did in college. I proceeded to get my Level 1 Crossfit certification to expand my own knowledge on the new sport. From there I was hooked. I have gone on to receive my Crossfit Powerlifting cert and Kids. 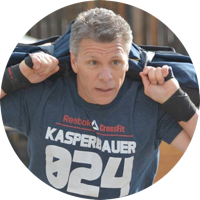 I have attended many seminars and certifications and will continue to do so as the sport evolves to bring the newest information back to 20 Mile Crossfit. I have always loved fitness and have always been active. I managed to gain 70 lbs during both my pregnancies. Yes, 70 lbs. at 5'1 that's a lot. I tried everything after my second pregnancy and could not loose weight. You name it, I tried it. I was fit but fat. My brother talked me into going to CrossFit one fateful morning. I did not want to go. I was overweight, borderline obese, and did not like the idea of working out outside the comfort of my lonely basement. I went once, thought I was going to die, left a sniveling ball of petty grievances and came back the very next class as to not let myself be defeated by this thing called CrossFit. Fast forward 6 months of CrossFit and Paleo and I had lost 47 lbs. I watched 50+ year old women come in afraid to lift a bar and start throwing big weight around in a few weeks. Watching the change in them, from the inside out, confidence, smiles and muscles coupled with the change in me made me passionate about this sport. I want to see others succeed, to go beyond what their minds tell them they can do. CrossFit has made me better physically but has changed me inside just as much. It is this passion that led me to want to train, to help others and to be a part of an incredible team of people who help and encourage one another to grow stronger and better, mentally and physically. I started CrossFit in 2010 as a way to get in better shape for cycling and snowboarding. I thought I was already in pretty good shape for a 50 year old. I didn't realize there was a whole new level of fitness available to me through CrossFit. I began coaching in 2012 and have loved every minute of working with people from all walks of life and at all athletic levels. I love helping people set and reach their goals. I have always loved being active. I grew up playing several sports in school and summer leagues. In December of 2014 after a pivotal time in my life, I began CrossFi. 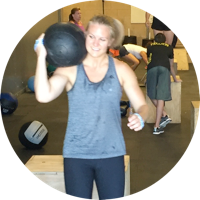 It was time for a change and I knew that CrossFit would be both challenging and empowering, so I gave it a shot and haven't looked back since. I do however, remember how surprised I was after completing my first WOD - I thought I was in way better shape than that workout proved. NOPE. My favorite thing about CrossFit is how it changes how I view obstacles in my life. It sounds silly, but CrossFit has taught me to believe in myself in ways I didn't anticipate. It happened to me and I see it happen every day at 20 Mile. There are very few things I have encountered that are as challenging, exciting and humbling as helping a person who doesn't perceive themselves as an active person find the strength and confidence to transform into an empowered version of themselves - and a legitimate athlete. My goal is to help athletes reach their athletic goals, while sharpening their confidence and challenging them. I began CrossFit, sort of as a mistake, in 2010. Home for the summer from college and in the local globo gym, not squatting and doing a lot of bench press, I was interrupted by a trainer that asked me to come try his “class”. I was unaware what the next 20 minutes would hold as I AMRAP’ed myself thru dumbbell thrusters, box jumps, pushups, and 400m runs… but when it ended in vomit and leg cramps, I knew I was hooked. I got my CFL1 cert in 2011 and began training in the back corner of a body builder gym in Lubbock, TX. Met my now wife, Camille, here as we began CrossFitting together every day, and never looked back. 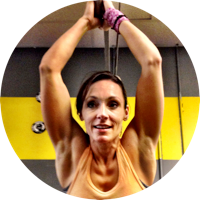 Since then, we have introduced both of our entire families to CrossFit, coached on our own in the “garage gym” setting as well a great affiliate, met lifelong friends, and crushed many personal goals – both physical and otherwise. We have recently relocated to Colorado from the Lone Star State and have found a home at 20 Mile. I love sharing fitness with friends, love to instruct, inspire, and sweat right alongside everyone who walks through the doors of a CrossFit box, whether it be the first time or the hundredth. CrossFit is family. TJ has always been involved in sports throughout his life. When he graduated from college and entered the adult world he didn’t have any thoughts about how he would maintain his physical fitness, he just figured he would always be active and the rest would follow. He continued on that path, playing football, softball and soccer, skiing and hiking, yoga and going on the occasional run. On a yoga retreat he met a friend who became a yoga instructor at a CrossFit box and invited him to be her plus 1 on her membership. He started in late 2013 and caught the bug. After his wife had their first child in 2014 they joined a CrossFit gym together and the rest has been history. Along this journey, TJ has begrudgingly acknowledged that what he puts into his body actually affects performance and has embraced nutrition as a key component of a happy healthy lifestyle. TJ loves how CrossFit is effective and can be scaled to anyone. He is excited to share his passion for the methodology and how it can improve your overall lifestyle. 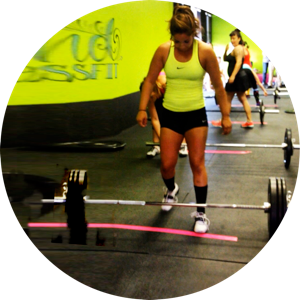 I first heard about Crossfit when I was in the fire academy in the Central Coast of California. I would love to tell you that I immediately tried it but that wouldn’t paint a clear picture of my journey. At first, I resisted because I thought I was getting everything I needed at the gym I was already going to. After finally giving in, I was immediately hooked. 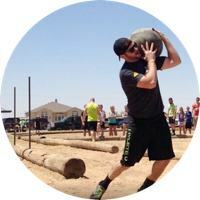 I found that Crossfit filled a competitive void left open after years in college football. What was even more satisfying was the community I found. Once a factor I hadn’t even considered, I now know that this is the most important aspect of any box. After I had some years under my belt, I wanted to find a deeper involvement in the sport. I looked for an L1, signed up and it’s been one of the most rewarding decisions I’ve ever made. My wife and I made the move to Colorado in 2016.  Once we were settled, we went in search of a new Crossfit and found 20 Mile. Somehow, I have lucked into coaching at another great box with another amazing community. After leaving my corporate job I was bored and found myself putting on a little weight. With some encouragement from my cousins I stated Crossfit in Oct of 2013. I was hooked immediately. I loved it right out of the gates. Every day is something new, a workout, a skill or a friend. 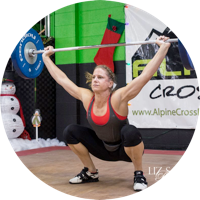 Right away I leaned toward the Olympic lifting component, it came easier to me, more natural. I really love working on lifting but the great thing about Crossfit is being able to also work on things that are hard for me, gymnastics and engine stuff. I addition to the skills I have meet the most amazing people and some of my closest friends. Outside of the gym you will find me camping, paddleboarding, hiking or snowboarding with my husband and daughter.